According to CBS Los Angeles, a 33-year-old man died in a wrong-way crash with a suspected impaired motorist on a Tustin freeway earlier this month. The collision happened at around 2 a.m. in the northbound lanes of the 55 Freeway. Filed Under: Personal Injury Tagged With: Accident attorney, car wreck lawyer, Irvine, Law Offices of Joesl W Baruch P.C. Will My Car Insurance Rates Increase after a Not-at-Fault Accident in California? From the Pacific Coast Highway to the Feather River Scenic Byway, California has some of the most beautiful roads in the country. Unfortunately, the risk of getting into a motor vehicle collision is always present when driving in traffic, even if you are on one of the most peaceful and picturesque streets in the state. [Read more…] about Will My Car Insurance Rates Increase after a Not-at-Fault Accident in California? 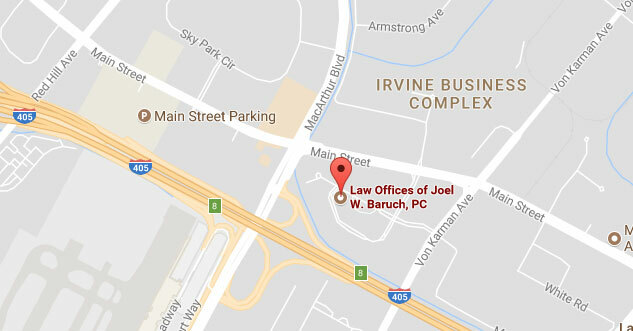 Filed Under: Personal Injury Tagged With: car accident, car accident lawyer, Irvine, Law Offices of Joel W Baruch P.C. According to The Orange County Register, a tragic pedestrian accident that occurred on a Sunday evening earlier this month resulted in one fatality. Police determined that a 76-year-old man was attempting to cross Lambert Road near Euclid Street in La Habra when a motorist hit him. Filed Under: Personal Injury Tagged With: car wreck attorney, car wreck lawyer, Irvine, Law Office of Joel W Baruch P.C. When Can You Sue for Wrongful Termination in California? When it comes to employment, that state of California operates under the at-will presumption. Although there are a few exceptions, the employment-at-will doctrine grants employers the right to terminate workers at any time without cause. Likewise, those who are employed “at will” have the right to abandon a position at any time without facing the threat of adverse legal action. [Read more…] about When Can You Sue for Wrongful Termination in California? How Can You Ensure a Safe Holiday Road Trip? If you are planning on hitting the road this holiday season to visit loved ones, you’re in good company. According to USA TODAY, more than 100 million Americans travel between December 23 and January 2 nowadays, and more than 90 million of them do so by car. [Read more…] about How Can You Ensure a Safe Holiday Road Trip? Filed Under: Personal Injury Tagged With: Auto accident attorney, Auto accident lawyer, Irvine, Law Offices of Joel W Baruch P.C. What Should You Do Following a Motor Vehicle Collision? According to the Insurance Information Institute, the lifetime chances of dying in a motor vehicle collision are approximately 1 in 645. Fortunately, most car accidents are not fatal. When you look at the lifetime chances of sustaining injuries, though, the odds are significantly higher. [Read more…] about What Should You Do Following a Motor Vehicle Collision? Filed Under: Personal Injury Tagged With: car accident, car wreck lawyer, Irvine, Law Offices of Joel W Baruch P.C. Thank you for believing in me. Without your support, I couldn't have made it through this. After the settlement was the first time that I felt it was not my fault. Thank you for that. - E.
Truly it was because of you — your concern and expertise that allowed my husband to be able to enjoy life. I am grateful. - C.M. I want to thank you, Joel, for all your help and words of encouragement. You are one hell of an attorney. - R. R.